"From Your Freezer to Your Family" Cookbook Review and Giveaway! Mama Say What?! | Mama Say What?! I was given the opportunity to review “From Your Freezer to Your Family” by Stephanie Brandt Cornalis of Mama And Baby Love and I was very excited to be able to try out her recipes. I downloaded her eCookbook (you can also buy a printed copy) and spent my evening reading. 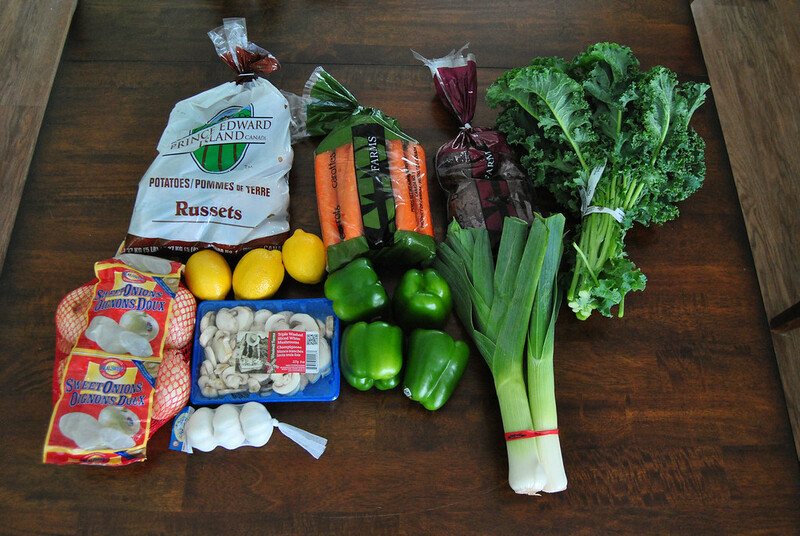 Stephanie has a passion for eating real food, eating foods that are in season, and buying local. I can totally dig that. In the summer here, my family and I have a rocking garden. I love being able to go pick fresh herbs, fruits, and veggies. We also regularly visit our local farmers market on the weekend and I go weekly to a local farm down the road for their fruits and vegetables and occasionally for their delicious fresh-baked goodies and their maple syrup. In the book, Stephanie offers four different methods for who to prepare your meals: 1- Freezer to Slow Cooker, 2- Fresh Dutch Oven to Stove Top, 3- Fresh Dutch Oven to Oven, and 4- Brown Meat to Slow Cooker. 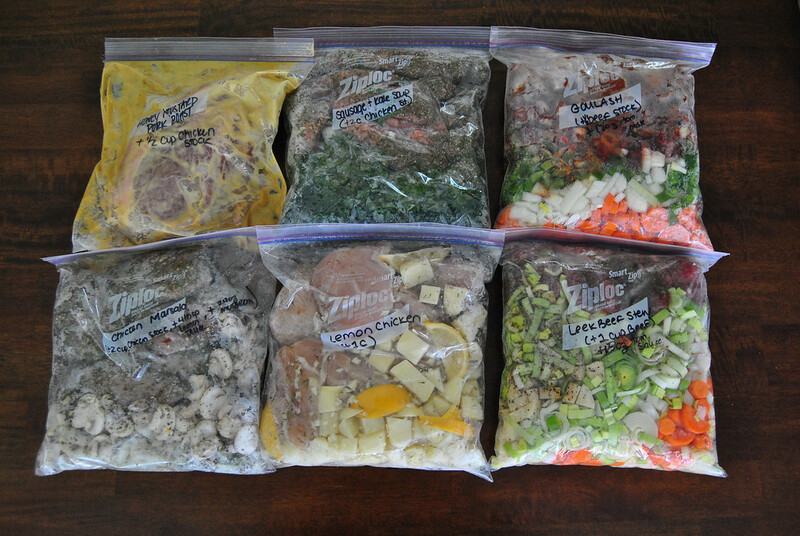 For me, the true test of a freezer slow cooker meal is method number one: how it turns out when you chop everything up, put it in your freezer, and then cook it straight from your freezer in your slow cooker. 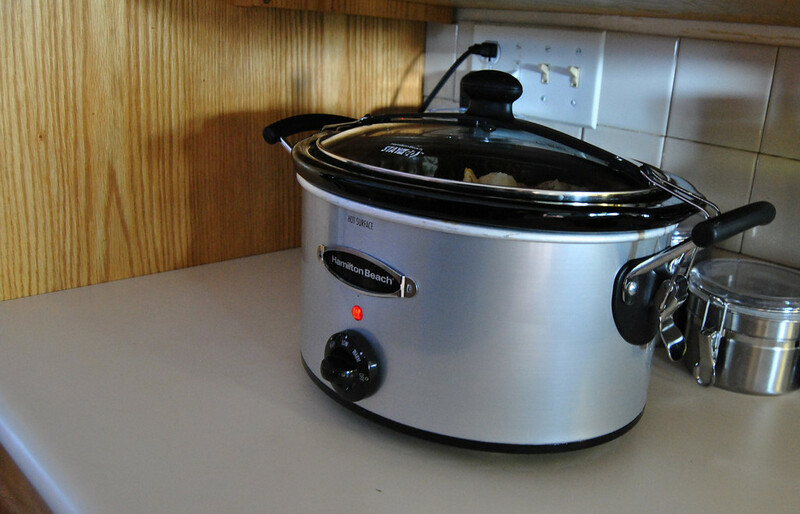 The big reasons I do freezer-slow-cooker-cooking are to save time in the kitchen cooking, to save money, to save time on clean-up. But, if you have the time and desire, feel free to try out the other methods. I think some of the recipes may fare better using the other methods. After reading through the introductions, the whys and the how-tos, I picked out six recipes that I felt would meet the needs of my family. I went through them with my husband and got the okay that they sounded yummy. I compiled a grocery list and set out shopping. 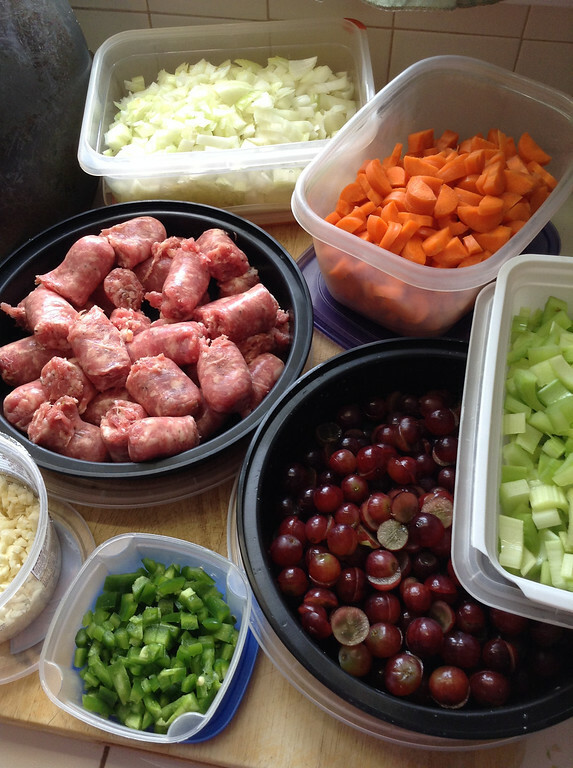 The following day I did all of the slicing, dicing, and packing and made all six meals. I had to take a few breaks, but I would say it didn’t take me longer than three hours to get everything done and cleaned up. 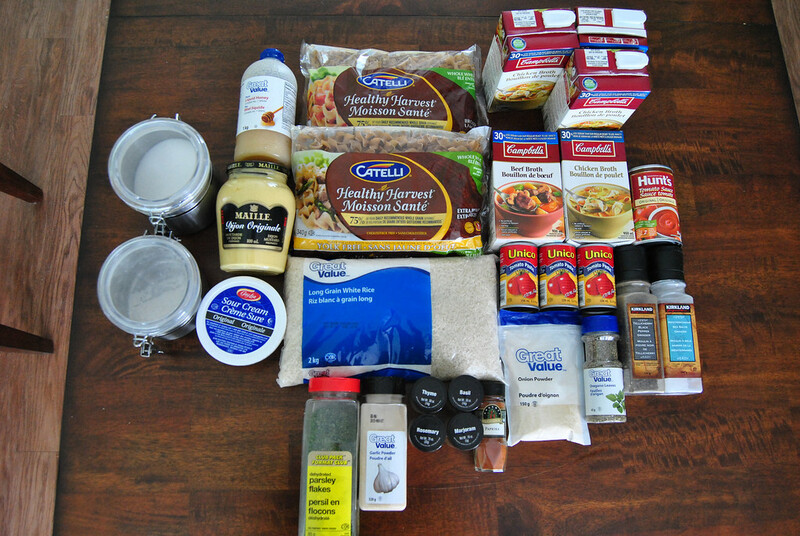 A lot of the recipes call for the same spices and ingredients and that helps cut down on time, and the recipes are pretty straightforward. We enjoyed the Leek and Beef Stew and the Chicken Marsala. They were good and both my husband and I agreed that the leftovers tasted better the next day. 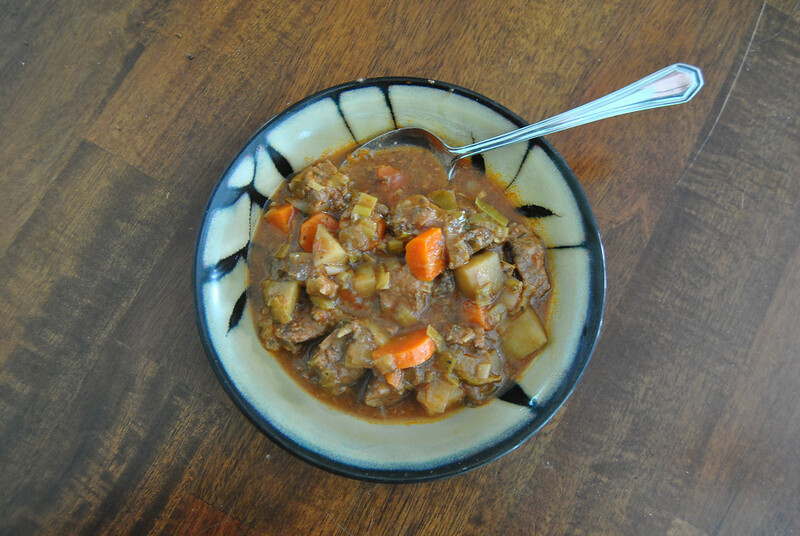 In the stew, I had to thicken up the liquid a bit, but that is expected when you have liquids in a slow cooker. The stew was hardy, but the leeks got a bit lost in there, it was hard to tell they were leeks. For the Chicken Marsala I did not use Marsala wine because I don’t really ever have wine on hand and I didn’t want to make a separate trip to the LCBO. She lists chicken stock as an acceptable substitute. While it was good, it didn’t taste like traditional chicken Marsala without the wine. Next I made Stephanie’s Goulash. I am not a huge beet fan, but the beet taste isn’t overpowering. It is definitely a tasty dish. 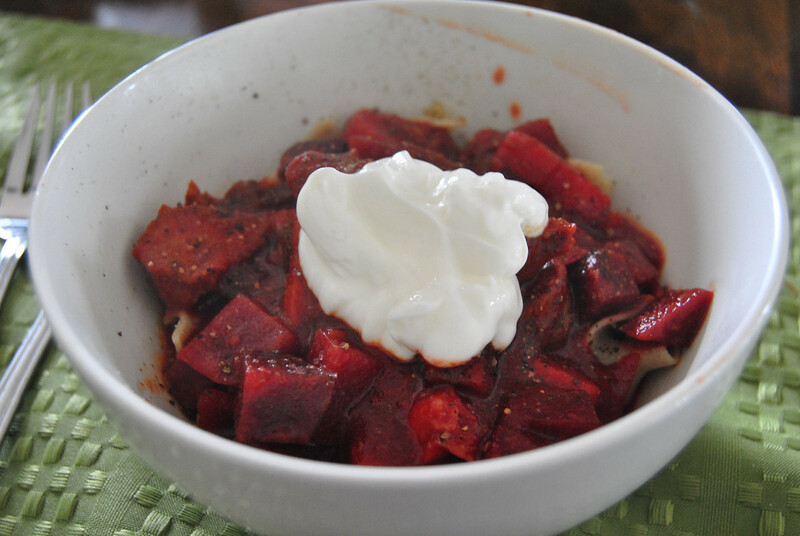 We usually serve ours over egg noodles topped with sour cream. We had my in-laws over for dinner that night, and they enjoyed it. 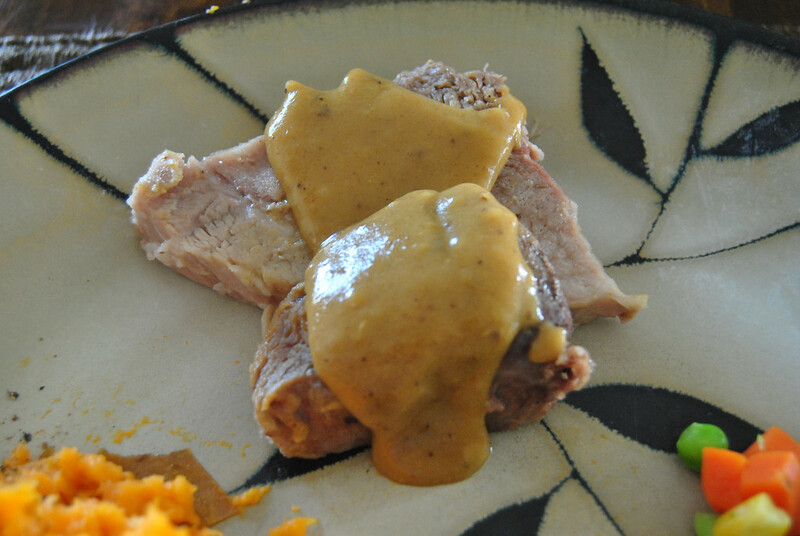 The last recipe we made is the Honey Mustard Pork Roast. I served it with sweet potatoes for me, baked potato for my hubby, and some mixed veggies. I thickened up the sauce by putting it on the stove top and adding some flour to it. Out of the six recipes we tried, this one was our favorite. I was very excited when we got the opportunity to work with Stephanie from Mama and Baby Love to work on a review and giveaway. 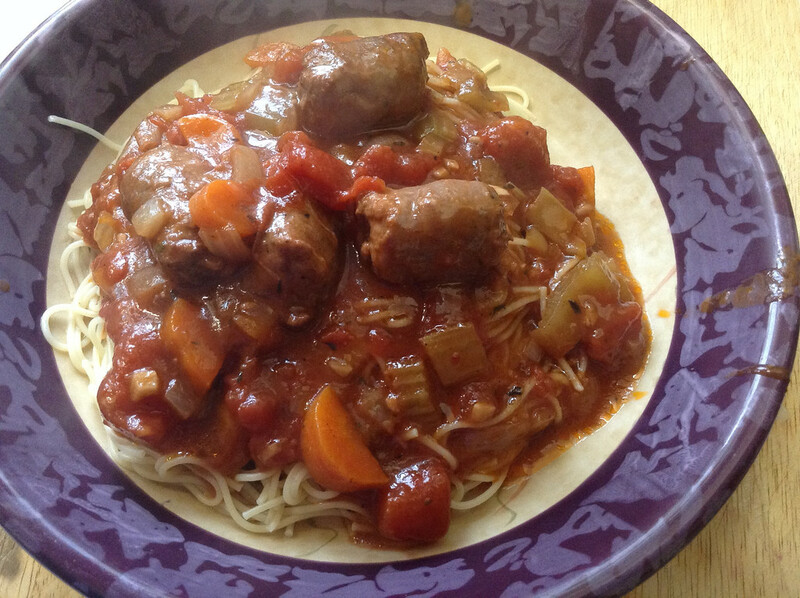 I LOVE using my slow cooker and within the past year have really gotten into making slow cooker freezer meals. I’m a working mama with two young kiddos, so time is important when it comes to getting a healthy dinner on the table! Stephanie’s cooking philosophy is admirable. She wants to provide healthy and nutritious meals for her family without spending hours in the kitchen. You won’t find any “un-clean” ingredients in her meals. No “cream of whatever” soups, no powdered mixes and no ingredients you can’t pronounce. 100% of her meals (according to her) are also gluten-free, grain-free and dairy-free. The following recipes are from her e-cookbook “From Your Freezer to Your Family.” I spent less than two hours one weekend chopping vegetables and preparing nine freezer meals. I made nine meals in all (two each of four meals and one of another). So far, we have tried four different meals and loved them all! Sausage and Tomato Ragu: This was by far the best in my opinion! The Italian sausage, vegetables, tomato sauce, wine and beef stock paired beautifully with the spices. The mixture is thickened with a little flour (Stephanie uses arrowroot flour) which makes the texture incredibly creamy and smooth. The flavor of the sausage seeps into the rest of the sauce as it cooks and the end result is mouth watering! We served this over gluten free pasta with salad. Amazing. 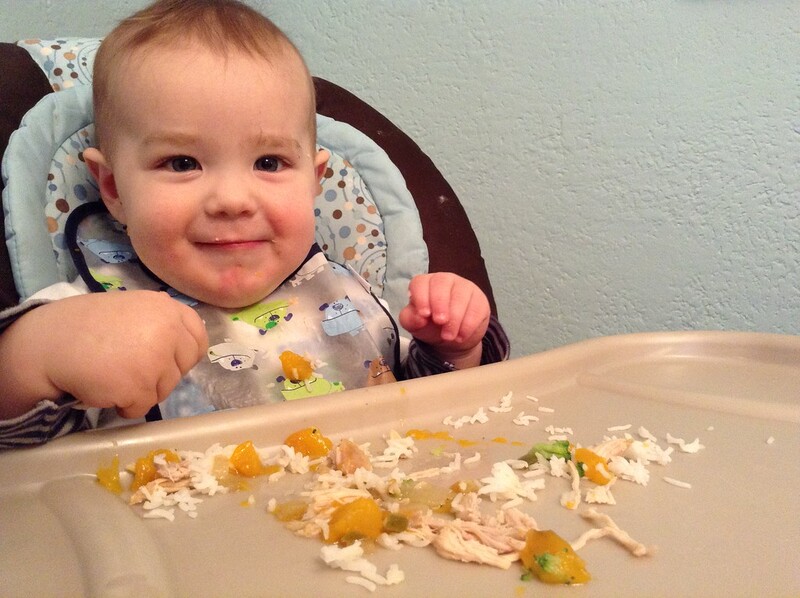 Mango Salsa Chicken: This dish was really, really good and devoured by my entire family – including my one year old and my picky toddler. That in itself is a victory! I used a bag of frozen mangoes from Trader Joe’s to cut down on a little prep work. I love spicy dishes and this dish calls for jalapeños which give it a nice flavor. I thought the end result was a little “soupy” which wasn’t a huge deal since I just spooned out the chicken, mangoes and some of the juices and served it over rice with broccoli. My one gripe with cooking chicken in the slow cooker is that it often comes out dry. I used boneless, skinless chicken thighs in this recipe and cooked for them six hours on low. They were perfect and very moist! I have a Hamilton Beach slow cooker and it switches to “warm” after it’s done cooking. I don’t need to worry that my meal will be done and sitting cold in my slow cooker hours before coming home from work if the cooking time is less than my work day. 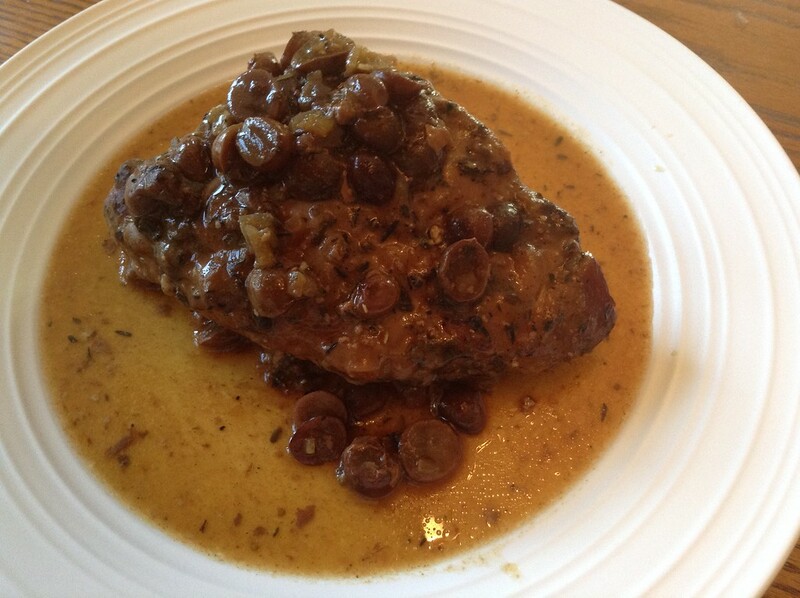 Pork and Grapes: If you’re like my husband, you’d be like “Um, pork and what?” but the sweet bite of red grapes with the spices that top the pork make for an incredibly appetizing dish. I used a pork loin roast that was on the thick side and my husband and I both agreed that next time, a thinner cut of pork would work better so it didn’t come out too dry. Another option would be to shred the pork so it could soak up more of the juices. I think we’ll do that with the other bag I still have in the freezer! Spicy Beef Taco Filling: We love tacos, fajitas and anything in the Mexican food category. A lot of times when people make tacos, they mix beef with a packet of spices and a ton of other ingredients that you can’t pronounce like silicon dioxide, thiamine mononitrate and ethoxyquin. I have no idea what those ingredients are, which makes me nervous to include in my dinner! This dish is not too spicy even though the name might make you think that. The beef, spices and tomato sauce blend beautifully as it cooks low and slow throughout the day. My one gripe with this meal was that since the beef came from the freezer, it was in a huge chunk. It didn’t break up as it cooked, so when I took the top off after it cooked all day, it was still a solid mass of beef. 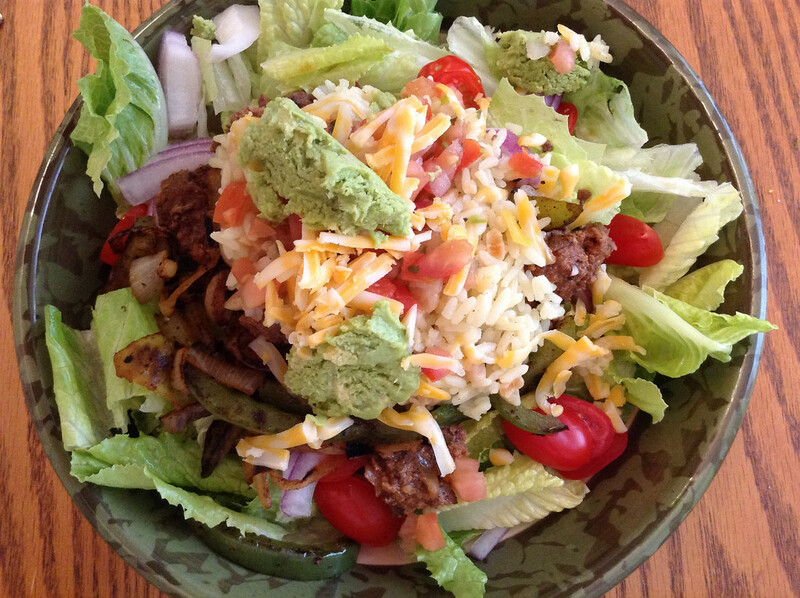 It didn’t impact the end result, which was a tasty taco salad for myself and fajitas for my husband. If I had the time, I’d probably rather make this on the stove top, but as a freezer meal, it was still excellent. We have a feeling that most of our MSW readers are busy mamas, just like us. So we know you’re going to be as excited as we are about this review…and it’s coming with a giveaway! Stephanie from Mama and Baby Love is being generous enough to offer us TWO awesome deals. TWO Mama Say What?! readers that enter our giveaway will be chosen to win a free copy of Stephanie’s ecookbook “From Your Freezer to Your Family” – a $15 value! If you don’t want to wait to see if you won, you can use the code MamaSayWhat25 to get an extra 25% off of her cookbook bundle – this includes THREE cookbooks – “From Your Freezer to Your Family”, “Gluten-Free and Grain-Free Baking” and “From Your Garden to Your Family.” You’ll pay just $18.75 for all three cookbooks, which is over a 50% discount! Click here to visit Mama And Baby Love. Enter our giveaway below and good luck! Readers must complete the first three entries to win. Winner must be 18 years of age or older. Winner may reside worldwide. Contest begins on Wednesday, April 9th and ends on Tuesday, April 15th at 11:59 PST. Added by Jessica S. on April 9, 2014. 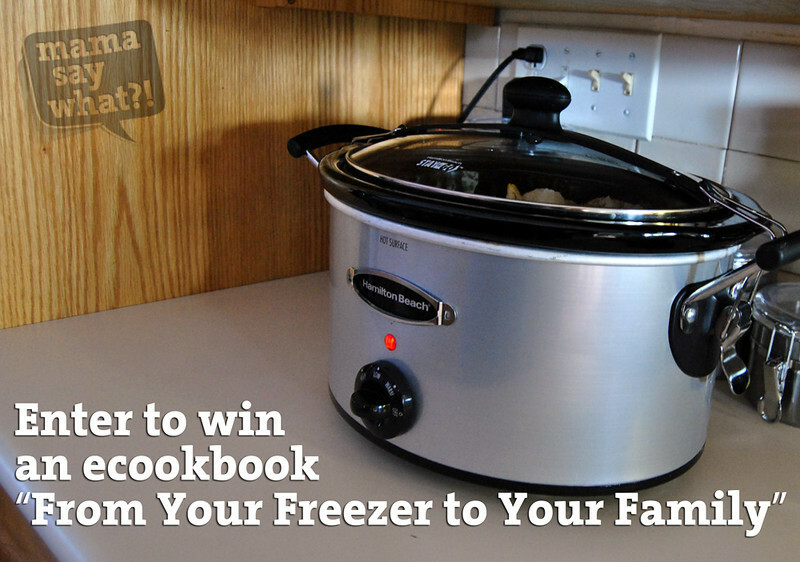 6 Responses to “From Your Freezer to Your Family” Cookbook Review and Giveaway! What a great review! This sounds right up My alley. I love freezer to crock pot meals. These recipes looks delicious! I’ll be looking into this! What a fantastic concept to make meals quickly and easily! I’ll be having a baby in the next couple of weeks, so this will be great to make dinners easy for my family. Thanks so much for the reviews! 6 meals in 3 hours? That’s awesome!! Especially since you only have a mess to clean up! I am really interested in starting this up. 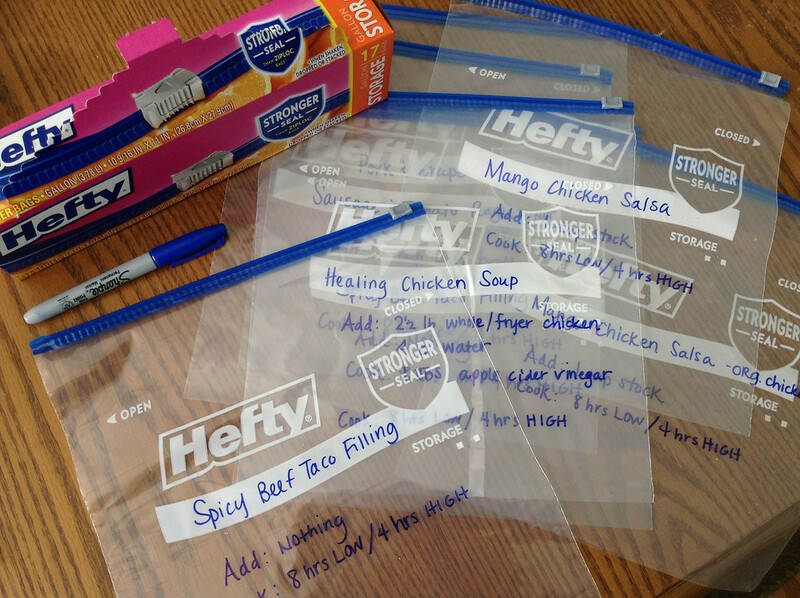 As a working mom who also goes to school, it can be challenging to plan and prepare meals.